Engine Timing Belt Kit with Water Pump GATES TCKWP297A. Contents : Belt, Tensioner, Hydraulic Tensioner, 2 Idlers, Water Pump, Bolt, Bushing, Gasket, Double-End Stud. Application Summary - 2000 : 2007-01 Audi, A8, V-8 4.2 L, Timing Component Kit. Country of Origin (Primary) : US. Harmonized Tariff Code (Schedule B) : 8413309090. Interchange Part Number : PP297LK3, TB297LK2, GTKWP297A, TCKWP297A, TB297LK3. Life Cycle Status Code : 4. Number of Timing Belts : 1. Number of Water Pumps : 1. Other Part Number : PP297LK4, BWPK42348, 20371K, TBK297AWP, CK297LK3. Product Description - Abbreviated - 12 : Belts. Product Description - Invoice - 40 : Timing Component Kit W/Water Pump. 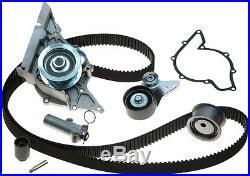 Product Description - Long - 80 : Timing Belt Component Kit W/Water Pump. Product Description - Short - 20 : Kit. The engine types may include 4.2L 4163CC V8 GAS DOHC Naturally Aspirated, 4.2L 4172CC V8 GAS DOHC Naturally Aspirated, 4.2L 4172CC V8 GAS DOHC Turbocharged. This part fits vehicles made in the following years 2001, 2002, 2003, 2004, 2005, 2006, 2007. This item may interchange to the following part numbers from other brands. Brands: ACDELCO, ACDELCO CANADA (NEW), ACDELCO PROFESSIONAL, ACDELCO PROFESSIONAL BRAKES, ACDELCO PROFESSIONAL CANADA, AUTOZONE/CRP, CARQUEST, CARQUEST/GATES, CONTINENTAL ELITE, CONTITECH, CRP, CRP CANADA, CRP/CONTITECH (INCHES), CRP/CONTITECH (METRIC-FULL), CRP/CONTITECH (METRIC-IMPORT), GATES CANADA, GOODYEAR TIRES, IMPORT DIRECT FUEL PUMP, IMPORT DIRECT IGNITION, IMPORT DIRECT RADIATOR FANS, NAPA, NAPA/GATES, NAPA/WATER PUMP KITS-WPK, SKF (CHICAGO RAWHIDE), STANT Part Numbers: 20371K, BWPK42348, CK297LK3, GTKWP297A, PP297LK3, PP297LK4, TB297LK2, TB297LK3, TB297LK4, TBK297AWP, TCKWP297A, WPK42348. ALL PARTS ARE NEW UNLESS NOTED AS RE-MANUFACTURED. COLOR OF THE ACTUAL PRODUCT MAY VARY AND COULD BE DIFFERENT FROM THE PHOTO!!! Portions of the part information on this page have been provided by WHI Solutions, Inc. The item "Engine Timing Belt Kit with Water Pump GATES TCKWP297A" is in sale since Thursday, April 06, 2017. This item is in the category "eBay Motors\Parts & Accessories\Car & Truck Parts\Engines & Components\Timing Components". The seller is "aimsautosupply" and is located in Santa Fe Springs, California. This item can be shipped to United States, Canada, United Kingdom, Australia, Japan, South Korea, Taiwan, South africa, Thailand, France, Hong Kong, Spain, Italy, Germany, Austria, Russian federation, Israel, Mexico, New Zealand, Philippines, Singapore, Switzerland, Norway, Saudi arabia, Ukraine, United arab emirates, Qatar, Kuwait, Bahrain, Malaysia, Brazil, Chile, Colombia, Costa rica, Panama, Trinidad and tobago, Guatemala, Honduras, Jamaica.